Winner of Queensland Pair with the Queensland Governor and Duncan Ferguson. Judging the Pen of Five Sale Rams, Dubbo. I have always been fascinated by genetics and animal breeding. 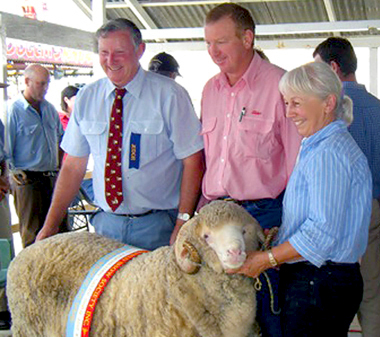 The family business included a Merino stud started by my grandfather, who also ran Hereford and thoroughbred studs for the Austins of ‘Booriyalloak’, Skipton, for many years…I must have inherited his love of animals. As a very small child I remember pestering my father to let me use his sheepdogs, and by the time I was six I was able to muster small mobs of sheep for him on my pony. 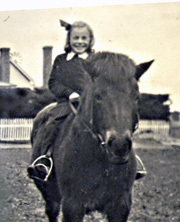 After leaving boarding school I completed a woolclassing course at the Gordon in Geelong, and for some time was the only practising female wool classer in Victoria; there was no separate award for women because none had been brave enough to pioneer this quintessentially male domain, so that was some compensation for the challenges faced! Unlike most classers whose only interest is sorting the wool, I was equally interested in the animals it came off; I soon realised that certain types were best suited to particular areas, and before long had started a small stud of my own. 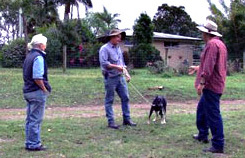 I have only been able to really indulge my passion for breeding since retiring to Queensland, having been restrained by family circumstances(read male influences!) all my life. 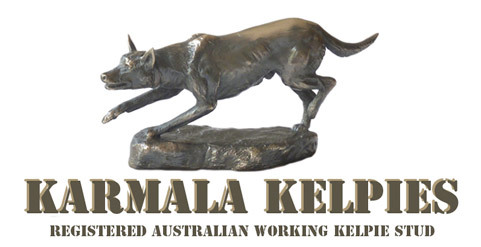 It has been a most rewarding experience running a Working Kelpie stud, and also achieving success with the small selection of stud ewes I brought North with me. With the decline of the wool industry I have decided to concentrate on the Kelpies, showing my sheep has become an expensive hobby with the decline of Merino ewe numbers and ram sales. The quicker turn over of generations also makes breeding kelpies very rewarding. It would have been impossible to achieve so much progress with my stud without the help of like minded people who have shared their knowledge and dogs’ genetics so generously. I have made many friends and met a wonderful group of keen stock people who have bought pups and dogs from me. Many of the younger generation are passionate about their dogs and keen to improve their stock handling skills, which is great to see. There are also a few who take an interest in bloodlines and are keen to learn about past good dogs, and I greatly enjoy our chats.